noun - a type of marketing that involves the creation and sharing of online material (such as videos, blogs, and social media posts) that does not explicitly promote a brand but is intended to stimulate interest in its products or services. Looking for an effective way to increase sales by driving more qualified traffic to your website and becoming the ‘go-to’ expert in your industry? If you answered ‘YES’, then you need to put an effective content marketing strategy into action in your business! The stats are undeniable… but many of you have tried blogging and it just hasn’t worked, right? 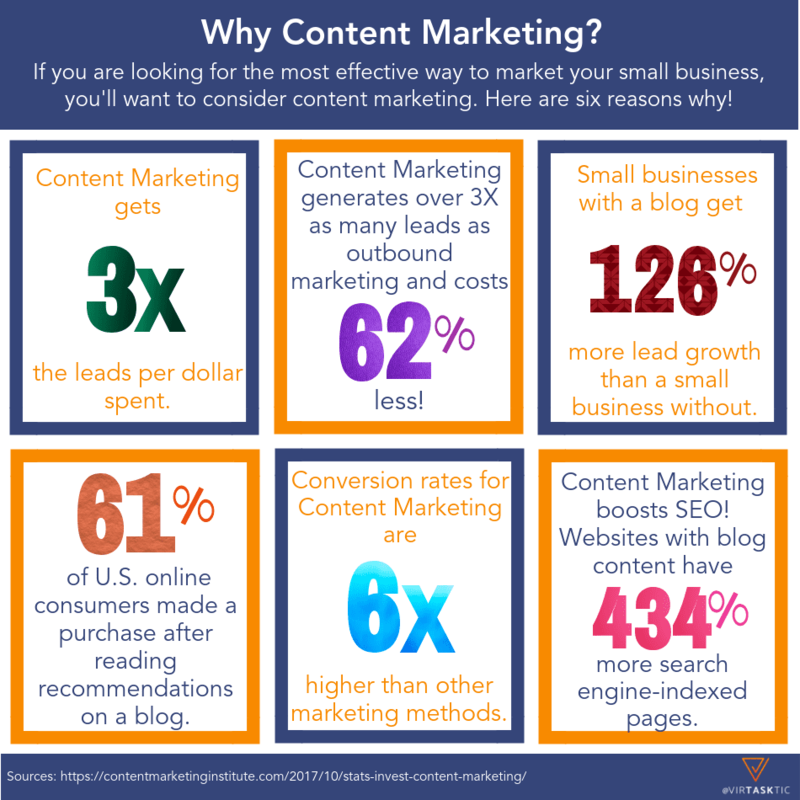 It’s not because content marketing doesn’t work for your business, it’s most likely because like SO MANY small businesses, you just aren’t doing it right! There is a lot more to content marketing than just tossing a 500-word blog onto your website. For content marketing to work for your business you need a CONTENT STRATEGY, VALUABLE CONTENT, and PROMOTION ACROSS ONLINE CHANNELS. This is where so many small businesses get content marketing wrong! You can pump out as much content as you want, but if you don’t write content that your target market wants, they’ll ignore you. If your message is not well written and providing true value, people won’t read it. If you don’t have an effective and complete promotion strategy, no one will ever find you. Here’s where VirTasktic comes in to turn you into a content marketing rock star! We designed our monthly content marketing packages to ensure you have a solid content and SEO strategy, are producing valuable content and promoting it consistently across the channels where your customers are hanging out. By doing this, we are able to increase your social engagement and following and drive more traffic to your website – all of which can lead to more sales! Ready to turn your blog into a powerful marketing machine? Find the package that works best for your time and budget! We have three levels of packages: Content Ripple, Content Wave, and Content Splash. If you want to write all of your content and have us edit and promote, then pick the ‘Lite’ package at the level you are interested in. Don’t have time to write and want to put it all in our dependable hands? Pick the ‘Full’ package at the level you are interested in and we’ll take care of everything! Our Content Ripple packages are designed for those who are ready to dip their toe into the water and invest in content marketing to boost their business. The package includes the minimum blog and promotion we suggest to start getting minimal traction online. ⇒ 2 Blog Posts p/month: we'll process two blog posts per month and upload to WordPress optimizing for SEO and include unique images for each post designed around your brand and article content. *While Content Marketing is one of the most effective ways to increase awareness of your brand, products, and services online, it does require you to be consistent and stay in it for the long haul. Therefore, there is a 6-month minimum for all content packages. However, if after 3 months we don't see an improvement in the traffic flow to your website, we'll fire ourselves! That's how certain we are about our packages effectiveness and how committed we are to our clients! ⇒ 4 Blog Posts p/month: we'll process four blog posts per month and then upload to WordPress optimizing for SEO and include unique images for each post designed around your brand and article content. ⇒ Custom Analytics Dashboard: Access to a customized analytics dashboard so you can see content performance as well as website traffic and other important analytics. ⇒ 4 Blog Posts p/month: we'll process four blog posts per month and upload to WordPress optimizing for SEO and include unique images for each post designed around your brand and article content. ⇒ 3-Month Editorial Calendar: We'll research topics and keywords relative to your market to create a suggested editorial calendar with 3 months of content. ⇒ Weekly Blog Email Broadcast: We'll prepare and send a weekly email of your newest blog post and/or newsletter to your prospect list via your email marketing software. ⇒ LinkedIn Publisher & Groups: We'll upload each blog post to LinkedIn Publisher and share it with up to three appropriate LinkedIn groups you are a member of. Not sure which package is right for you? Let's chat to see where we think you'll get the biggest bang for the bucks in your budget!